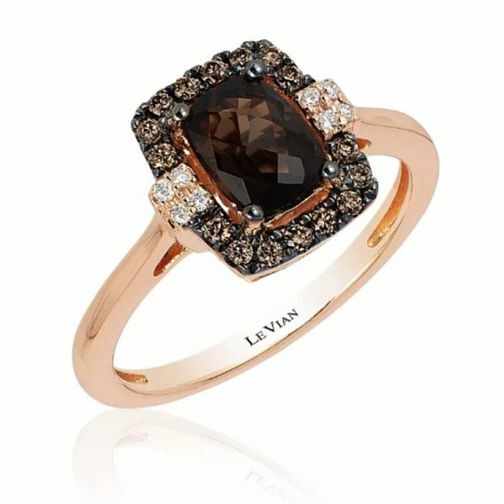 Indulge in the elegant beauty of Le Vian. This stunning ring is crafted from luxurious 14ct Strawberry Gold and features a dramatic Chocolate Quartz centrepiece, surrounded by a halo of Chocolate Diamonds finished with Vanilla Diamonds for a look that simply dazzles. From ancient royalty to today's red carpet, Le Vian is the couture jeweller of choice. 14ct Strawberry Gold Chocolate Quartz & Diamond Ring is rated 3.0 out of 5 by 1.